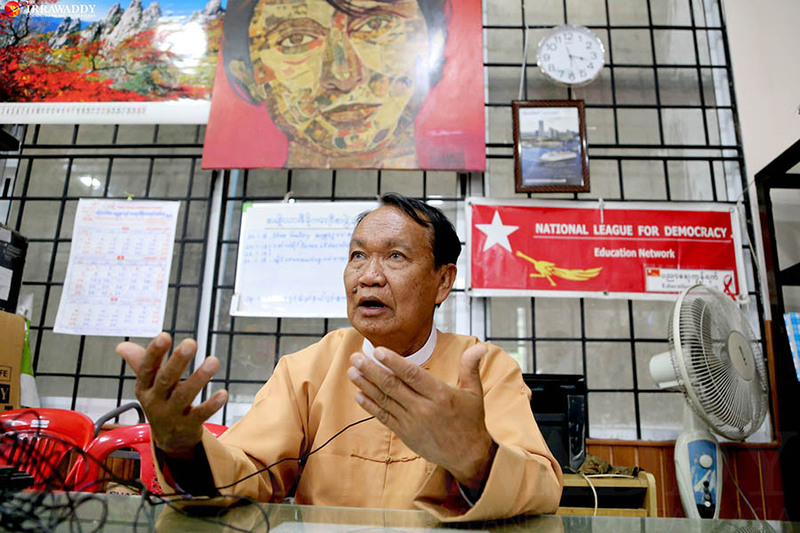 YANGON — National League for Democracy (NLD) executive committee member U Win Htein’s house in Naypyidaw was shuttered on Friday morning, sparking unconfirmed rumors on social media that the party had suspended him from his duties, and even that he had resigned. Sources close to U Win Htein told The Irrawaddy that the senior NLD official had submitted a letter of resignation to the party and was scheduled to travel to Australia for a vacation this weekend. Speculation over U Win Htein’s fate has mounted steadily since a lavish wedding celebration was held for his son, Hsan Win Htein, in Naypyidaw last week. The expensive wedding celebration has become a topic of conversation across the country. U Win Htein, who has already obtained a visa to travel to Australia, denied that he had resigned when contacted by The Irrawaddy on Friday morning. “It’s all based on rumor. Where did you get that information?” he asked, before declining to take any further questions. Win Htein’s decision to travel abroad amid the outpouring of criticism over the wedding raised eyebrows among political analysts. Senior NLD members U Nyan Win, Dr. Myo Nyunt and Monywa Aung Shin held a meeting at NLD headquarters in Yangon’s Bahan Township on Friday. Reporters from several media organizations including The Irrawaddy visited the office to question NLD officials. Despite repeated questioning, Monywa Aung Shin would not be drawn on the issue of Win Htein’s resignation, refusing to confirm or deny it. He said only that according to party procedure, those who fail to perform their duties or who breach the party’s principles should be replaced by the most qualified candidate. Contacted on Friday, NLD central executive committee member Dr. Myo Nyunt told The Irrawaddy he had no information on Win Htein. A senior NLD official from Yangon division told The Irrawaddy tensions between Win Htein and other senior party officials had grown in recent years as Win Htein had abused his position and made controversial decisions without informing other committee members. In particular, the official said, Win Htein had given verbal orders that some NLD central committee members be fired. His power appeared to have been waning recently. In August, even State Counsellor Daw Aung San Suu Kyi, to whom he was a close aide, advised Win Htein to take some time off for a medical examination in a hospital. However, The Irrawaddy has learned that there were no problems with Win Htein’s health, and that the move was intended to warn Win Htein that he had crossed a line with Suu Kyi. The State Counsellor’s suggestion followed Win Htein’s poor handling of a rumor that President Htin Kyaw would resign. Win Htein said publicly that the rumor was likely started by people linked to the military, the Union Solidarity and Development Party, or IT people. The Army vigorously condemned the ruling party over the suggestion, describing it as a groundless accusation that harmed the dignity of the military.